The political education of Mario Vargas Llosa. By Mario Vargas Llosa; Anna Kushner, trans. Nearly 40 years later, in 2005, Vargas Llosa received a very different sort of prize and delivered a very different kind of speech. Accepting the Irving Kristol Award from the American Enterprise Institute, he denounced the Cuban government and called Fidel Castro an “authoritarian fossil,” praised the Austrian School economist Ludwig von Mises as a “great liberal thinker,” and defended calls for privatizing pensions. It was quite a remarkable transformation. In the opening paragraph of Vargas Llosa’s 1969 novel, Conversation in the Cathedral, the protagonist asks: “At what precise moment had Peru fucked itself up?” It is a question that many people have asked as well of Peru’s greatest novelist. Vargas Llosa is unquestionably one of the most important writers of his generation. He has written 18 novels, at least five of them considered by critics to be of great literary significance. His first, The Time of the Hero, was published in 1963. It dramatizes an act of rebellion by the cadets at Peru’s Leoncio Prado military academy, which led to copies of the book being burned on the school’s parade ground. His next novel, The Green House, was published in 1966 and proved to be a difficult modernist work which depicted Peruvian reality as a confluence of the Catholic Church, the military, indigenous culture, and the brothel that gives the novel its name. A powerful experiment in form, The Green House has usually been read as a critique of capitalism, imperialism, and patriarchy, and it helped cement Vargas Llosa’s reputation as one of the key writers of the “boom” generation in Latin American letters. Whether as a young socialist or an older liberal, Vargas Llosa has always been an engaged intellectual. Born in 1936 to a middle-class family in southern Peru, he began writing when he was still a teenager, publishing in the local newspapers. In the 1950s, he belonged to a small communist cell, and while attending the National University of San Marcos, in Lima, he read Marx, Sartre, and the Peruvian Marxist José Carlos Mariátegui. Observing the corruption of elites and the inequalities of Latin American society led Vargas Llosa to socialist politics in those years. But the socialism he hoped for was one that respected artistic freedom. In the 1960s, as his writing career began to bring him attention, Vargas Llosa remained committed to socialism and to his role as an engaged intellectual, writing on current affairs and advocating for political change. Writers, he insisted, had an important role to play in social transformation. Even as he took up residence in Paris and participated in the cosmopolitan circles of the boom generation, mixing with writers like Colombia’s Gabriel García Márquez, Mexico’s Carlos Fuentes, Chile’s José Donoso, and Argentina’s Julio Cortázar, he continued to believe that writing great literature was a politically radical act—one that would help bring revolution to Peru and the rest of Latin America. By the late 1980s, when Peru’s President Alan García sought to nationalize the country’s banks and financial institutions, Vargas Llosa found enthusiastic audiences with his counterargument that free markets and political freedom were inseparable, and in 1990, he entered the race for the presidency himself. Running on a platform quite at odds with his earlier socialism, he called for the privatization of state-owned industries and the reform of public education. Vargas Llosa came in first in the initial round of voting, but fell short of a majority in the second round. He lost to Alberto Fujimori, who implemented similar neoliberal reforms, but whose dirty war against the Shining Path involved illegal and undemocratic actions. (In 2009, Fujimori was convicted of corruption and human-rights violations.) After his electoral defeat, Vargas Llosa left Peru and became one of Latin America’s best-known and most widely read intellectuals. His syndicated columns in the Spanish newspaper El País commented on political matters from a right-wing liberal perspective. (These days, Vargas Llosa has become tabloid fodder as well, having left his wife of 50 years—his cousin Patricia Llosa—for the Spanish-Filipina socialite Isabel Preysler.) Few people have lived a life in which politics and literature have been so thoroughly entwined. But the question remains: to what end? Sabers and Utopias collects just a fraction of Vargas Llosa’s political writing over the past four decades, much of it derived from his newspaper columns. Some of the pieces are historically significant: For example, the 1987 essay “Toward a Totalitarian Peru” was the foundation of his presidential campaign. Others are more ephemeral, weighing in on topical issues, mostly in Latin American politics. The earliest is from 1971, the most recent from 2014. Translated by Anna Kushner, the collection provides a flattering version of Vargas Llosa’s idea of Latin American liberalism, while omitting the complexities of his political evolution. Even if they amount to a selective guide to Vargas Llosa’s thinking, the essays do offer a reasonable representation of the Latin American liberal view of politics, which fears both left-wing radicals and right-wing dictatorships and is particularly troubled by “populist” solutions to political problems. 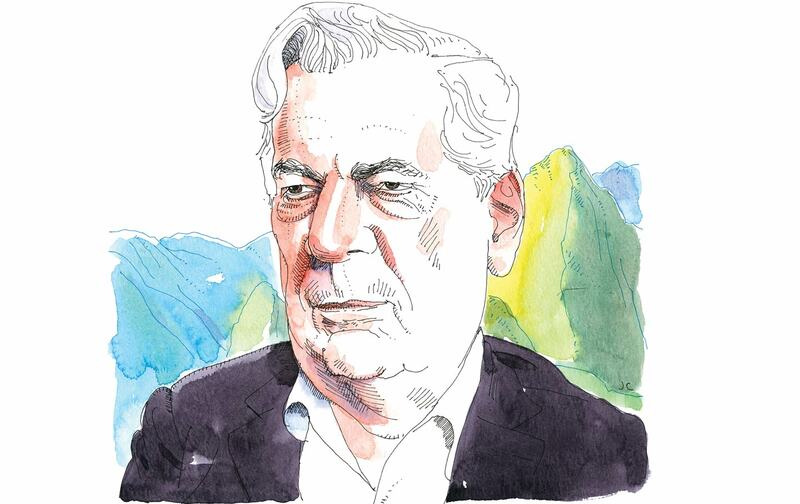 Vargas Llosa defends market liberalization and individual political rights, and warns his readers of the dangers of both the state and the masses. Whatever one might find to agree or disagree with in this collection—and readers to Vargas Llosa’s left will find something of both—the worldview that he outlines in these essays also reveals the shortcomings of his political imagination (as well as that of many Latin American liberals). Vargas Llosa’s theory of politics does little to account for the conflicts between market economies and political democracy. Like other Latin American liberals who have trouble understanding why their chosen platforms don’t produce electoral majorities, he tends to blame the voters when he would be better off thinking about how his preferred programs fail to meet the people’s needs. Even during his Marxist years, Vargas Llosa judged the health of a society by how it treated its writers, and the first essay (if only they had been arranged chronologically here) is the open letter that he wrote in response to the so-called Padilla affair in Cuba, in 1971. More than a decade earlier, the success of the Cuban Revolution had been a moment of serious recalculation in Latin American politics. For the many who assumed that corruption and unaccountable, US-backed dictatorships would remain the norm in the region, Cuba provided evidence that another future was possible. Many intellectuals of Vargas Llosa’s generation responded with enthusiasm and sympathy, advocating for a similar revolution in their own countries. Even as Castro’s government developed a closer relationship with the Soviet Union, Cuba retained a reputation for having a freer strain of communism than its Soviet-bloc counterparts. One of the things that signaled this difference was the revolution’s treatment of artists and writers. Castro assured them that they did not have to be militant revolutionaries, and that there was no prescribed way to produce “socialist” art. Attracted to this vision of a revolution that combined socialism and artistic freedom, intellectuals of the international left defended Cuba and became an important part of the Castro government’s international public-relations strategy. Many Latin American writers—Vargas Llosa among them—flocked to the island to serve on the juries of the Casa de las Américas cultural organization. The Padilla affair, which intensified when the poet Heberto Padilla was arrested by the Cuban government, marked a turning point for many of the revolution’s fellow travelers. In the late 1960s, Padilla often explored disenchantment with the revolution in his poems. For a time this was tolerated, but the situation deteriorated in 1968, after Padilla won a Cuban literary prize. Padilla’s book was published, albeit with an official disclaimer, and articles attacking him soon began to run in state organs, including the Cuban Army magazine Verde Olivo. After his arrest and imprisonment, Padilla appeared in public and gave a coerced statement of debasing self-criticism, while accusing his friends and associates of similar deviations. Disturbed by this turn of events, Vargas Llosa penned an open letter in which he decried Padilla’s treatment, arguing that it “recall[ed] the most sordid moments of the Stalinist era,” and demanded that the Cuban Revolution “return to what it was when we considered it a model within socialism.” Vargas Llosa recruited many famous Latin American, European, and US writers who had supported the revolution to sign the letter as well. It would be tempting to conclude that the Padilla affair led Vargas Llosa toward a more strident and right-leaning liberalism, and Sabers and Utopias does not attempt to avoid that bit of mythology, since the next essay that it includes (in chronological terms) dates from 1979. But, in fact, Vargas Llosa was rejected by the left for criticizing the lack of freedom in socialist states long before he rejected it. Over the course of the 1970s, he began to rethink whether there was a fundamental incompatibility between socialism and freedom of expression. In those years, he discovered Cold War liberals like Raymond Aron and Isaiah Berlin, who argued against the utopian qualities of Marxism and in favor of protecting individual freedom within liberal democracies. In a 1975 essay not included in Sabers and Utopias, Vargas Llosa declared that Cuba and the Soviet Union did not represent the socialist ideal he had hoped for. By 1979, he was arguing that Marxism was devoted to a utopian vision inherently incompatible with liberty. Spending 1980 at the Wilson Center in Washington, DC, Vargas Llosa discovered Friedrich Hayek’s The Road to Serfdom, and The War of the End of the World reflects these new preoccupations. In telling the story of the suppression of a millenarian community in Brazil in the 1890s, Vargas Llosa—whose writing once captured the costs of capitalist exploitation—now offered a warning about the dangers of fanaticism, which he increasingly associated with the political left. Vargas Llosa sometimes attributes a supposed Latin American tendency toward “utopianism” to a peculiarly Latin American psychology. “The rejection of what is real and possible” is a robust tradition in the history of Latin America, he asserted in a 2001 essay, “Down With the Law of Gravity!” Contrasting Latin America with Switzerland, he insisted that perhaps “social and economic progress is in direct proportion to the vital boredom signified by complying with reality and inversely related to the spiritual effervescence that comes from rising up against it.” This argument is not particularly original. (It is reminiscent of the legendary—but factually incorrect—speech made by Orson Welles as Harry Lime in The Third Man: Italy has strife and produces Michelangelo; Switzerland has years of peace and invents only the cuckoo clock.) But it does capture Vargas Llosa’s political evolution at the time: He preferred the boredom of prosperity and a restrained liberal order to the enthusiasms of radicalism. Attaining that prosperity, Vargas Llosa came to believe, required an adherence to “reality,” and his understanding of that reality was essentially identical to the discipline of the market. In the 1980s, Vargas Llosa formed a close relationship with the Hayek-inspired Peruvian economist Hernando de Soto. He wrote the prologue for de Soto’s 1986 book The Other Path, whose title refers to the Shining Path guerrillas, then at war with the state; de Soto’s “other path” involved distributing formal property titles to the poor, which would in turn give them access to credit. This would have the effect of breaking the state’s close alliances with the country’s elites, which de Soto and Vargas Llosa deemed obstacles to growth, while also bringing the poor into new markets. Vargas Llosa may have considered this a form of realism, but a belief in the power of the market to solve social problems often rests on its own kind of utopianism. Studies evaluating the success of de Soto’s implemented programs have shown that his economic proposals failed to increase the availability of credit. His prescriptions were premised on the idea that people could not direct all of their energy to work if they did not own their own homes. But this fundamentally misunderstood the lives of the poor and their needs: The residents of squatter neighborhoods were still of course integrated into markets, and they also had strong collective organizations that protected their homes while they were at work. Like many liberals, Vargas Llosa primarily attributes poor economic conditions to internal factors that the economy itself cannot address. Encourage investment and put markets to work, the thinking goes, and any country can be the next Taiwan, South Korea, or even China. This analysis, however, leaves little room for considering the effects of colonialism or neocolonialism. Vargas Llosa is not wrong to assert that a popular version of dependency theory—which holds that rich nations are rich because they have extracted surplus from the periphery—doesn’t stand up to rigorous scrutiny. Nevertheless, the explanation for poverty in Latin America cannot ignore the region’s place in the world economy, including a recognition that a dependence on the export of raw materials for the global market leaves countries vulnerable to forces they do not control.Vargas Llosa’s defense of liberal democracy also elides the fact that none of the “economic miracles” he hopes to re-create began under democratic conditions. Subsequent developments in his own country might call into question his presumed opposition between free markets and authoritarian politics. Fujimori’s reforms marked a simultaneous “opening” of the market and a closing of civil society and politics. To Vargas Llosa’s credit, he recognized that, while Fujimori’s reforms “put the economy on a sounder footing…they have failed to further justice, because they have not broadened in the slightest the opportunities of those who have less, so as to enable them to compete on equal terms with those who have more.” But the connections between Fujimori’s economic program and his political repression were not some kind of unfortunate accident. Vargas Llosa’s views of the economically liberal but murderous dictatorship of Chilean dictator Augusto Pinochet have the same flaws. “There are fools who still believe that a Pinochet is necessary for a backward country to begin to progress,” he wrote in 2006, after Pinochet’s death. Chile progressed, he argued, not because of the dictatorship but in spite of it; specifically, it grew because of the University of Chicago–trained economists who brought their brand of free-market ideas to the country under Pinochet’s regime. But Chile’s real economic ascent happened mainly after Pinochet’s departure from power, and the extreme aspects of that free-market program could only have been put in place under politically repressive conditions. The problem is not that Vargas Llosa favors these conditions, but rather that he is unable to see that his preferred economic prescriptions frequently require them. In the essays included in Sabers and Utopias, Vargas Llosa does recognize that the right as well as the left can pose great threats to democracy, and he has been willing to endorse leftist candidates to prevent right-wing figures whom he views as more dangerous from coming to power. For example, he endorsed Ollanta Humala in Peru’s presidential elections in 2011 because Humala’s opponent was Keiko Fujimori, the daughter of his old rival. Furthermore, Vargas Llosa’s libertarian inclinations on social issues give him some areas of common ground with many on the left. He opposes the death penalty, favors equal rights for sexual minorities, and advocates for the decriminalization of drugs. He will defend the center-left when it advances those priorities; he has high praise for the social-democratic governments of Uruguay, which have experimented with drug legalization, calling the country in 2012 “a paragon of legality, freedom, progress, and creativity, an example that the rest of the Latin American countries should follow.” But, in directing much of his contempt toward the left, he also has the habits of a Cold War liberal. “Left populism,” he argued in 2018, “is the populism that is most disastrous, negative, ruinous for a country.” Elsewhere, he has attributed the interest of intellectuals in statism to their “vocation for seeking handouts” and “their lack of economic knowledge.” Even in instances where his critiques are warranted, they are not especially insightful, resting heavily on stereotype and caricature. To observe that this argument is not particularly helpful is not to deny that people can form strong bonds of attachment to figures across the political spectrum, especially to charismatic leaders. Nor is it to ignore that popular enthusiasm can turn sour, be abused, or support repressive projects. And it is true that bad economic management harms the poor and vulnerable. (Though it might be noted that Bolivia scarcely rates a mention in Sabers and Utopias—a country run by a “left populist” government, whose economy has grown faster under President Evo Morales than, say, “neoliberal” Mexico’s did over the same period.) However, one can make all of these arguments without attributing popular discontent to cultural defects or an irrational “fear of freedom.” Voters who turn to populists have often been disappointed by traditional political parties and previous attempts at reform, including the liberal efforts that Vargas Llosa prefers. In holding “populism”—from Juan Domingo Perón in Argentina in the middle of the 20th century, to Hugo Chávez in the 21st—responsible for regional woes, Vargas Llosa makes a mistake common to right-wing liberal thought, which conflates its fear of the populist ruler with the masses to which he is linked. Vargas Llosa also misses why the left is so often critical of the kind of neoliberal reforms that he proposed. A well-managed economy is not a bad goal—but well-managed for whom? Vargas Llosa may have been acutely aware of the deficiencies of government-run enterprises and of power concentrated in the hands of the state, but in making a fetish of the market’s ability to solve social problems, he has overlooked how often it led to a concentration of wealth among the ruling elites. Vargas Llosa is right that the strain of authoritarian socialism he defended in his youth did not guarantee important freedoms. But his right-wing framework ignores the left’s best critiques of liberalism. Confined merely to the field of politics, “democracy” can lead to undemocratic outcomes in the economy and society that ultimately result in oligarchy. Likewise, the achievement of human freedom is a complex goal—one that will never be attained through markets alone. This exchange, of course, honored their friendship and the writers they jokingly disparaged. It is a measure of Vargas Llosa’s significance that one can imagine a parallel scene playing out in the early 21st century, when a dying writer would whisper to his friend: “Vargas Llosa, more so”—a statement whose meaning would lie not in whether it was true or false, but in whether it still mattered enough to say. Patrick IberPatrick Iber is an assistant professor of history at the University of Wisconsin, Madison. He is the author of Neither Peace nor Freedom.